Today gold price in 6 for 24 karat gold is 6 rupees per 10 grams. Gold price in 6 for 22 karat gold is 6 rupees per 10 grams. This calculator uses the current 6 Gold Price Calculator price for India only. Other prices for other countries, click here or for other cities, click here. Today 24 karat gold price in 6 given in rupees per gram, 10 grams, 100 grams and 1 kilogram of gold. 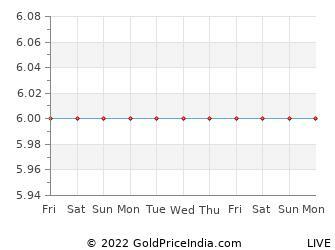 Yesterday gold price in 6 for 24 karat and 22 karat gold given in rupees per 10 grams. Highest gold price in 6 for 24 karat gold in the month of April 2019 was 6 rupees per 10 grams while the lowest gold price was 6 rupees. Gold price on 01 Apr 2019 was 0 rupees per 10 grams. Highest gold price in 6 for 24 karat gold in the month of March 2019 was 6 rupees per 10 grams while the lowest gold price was 6 rupees. Gold price on 01 Mar 2019 was 0 rupees per 10 grams. Gold price at the end of month was 0 rupees. Highest gold price in 6 for 24 karat gold in the month of February 2019 was 6 rupees per 10 grams while the lowest gold price was 6 rupees. Gold price on 01 Feb 2019 was 0 rupees per 10 grams. Gold price at the end of month was 0 rupees.